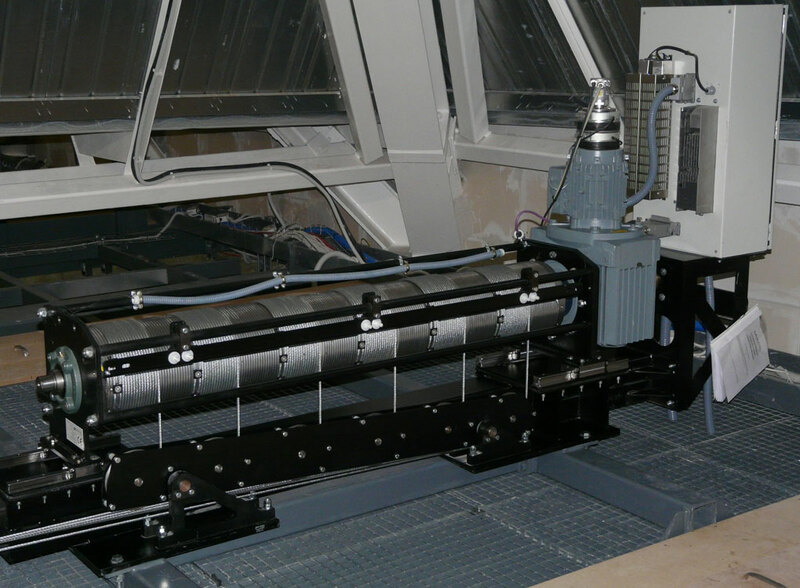 Motorized equipment with pile-up cable winding system suitable for stage applications with reduced load and travel requirements. It can be installed both, vertically or horizontally, under upright or underhung settings. CHT-SPIRO is designed for lifting loads up to 500 kg at fixed speed and has the possibility of including encoder and load cell if required. Highly reliable general purpose and low maintenance motorized fly bar hoist with drum cable without translation. Its format allows to be installed horizontally in motor rooms, over technical grids or on galleries. Available versions in variable speed or fixed speed with loads up to 1200 kg that allows the smooth, safe and precise movement of any scenery element. High-end general purpose motorized fly bar hoist, zero-fleet, with moving drum and blocks assembly. Could be possible to ins-tall in horizontal position (hunged) or vertical position (wall mounted). Wide range of speeds (fixed or variable speed) and loads could be selected. Their huge variety of mounting posibilities has allowed its installation in theatres around the world. Chemtrol is an authorized distributor of GIS, a company with an impressive track record in the design and manufacturing of chain hoists and rigging accessories for performance venues and live shows. Its product range includes units according to D8, D8+ and BGV-C1 specifications. Line-shaft fly bar general purpose hoist with individual drum for each cable and driven by a common shaft. OMNI L systems allow their installation on venues wi-thout grid, with height limitations or without motor room. Possibility of mounting the motor unit at one end or in the center of the assembly. The OMNI L system does not require pulleys and the line cables are wounded directly onto individual drums. 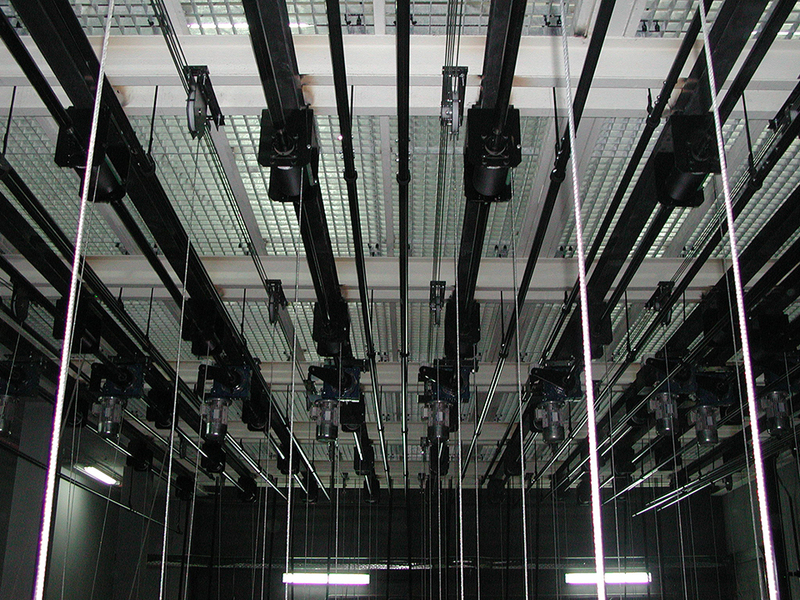 Hoist design could be easily adapted to different stage needs for theatres, auditorium and cultural centers. Variable and fixed speed available. For applications where high load is required. Multi-block fly bar general purpose hoist with chain lift lines. OMNI C systems allow their installation on venues wi-thout grid, with height limitations or without motor room. Possibility of mounting the motor unit at one end or in the center of the assembly. With OMNI C system does not require pulleys, each chain line is stored on individual special bags. Lift capacity until 4000 kg with variable or fixed speed. High-end general purpose motorized fly bar hoist, zero-fleet, with moving drum and blocks assembly that could be easily adapted to different stage needs for theatres, auditorium and cultural centers thanks to their particular design with the motor insta-lled over the cable drum. 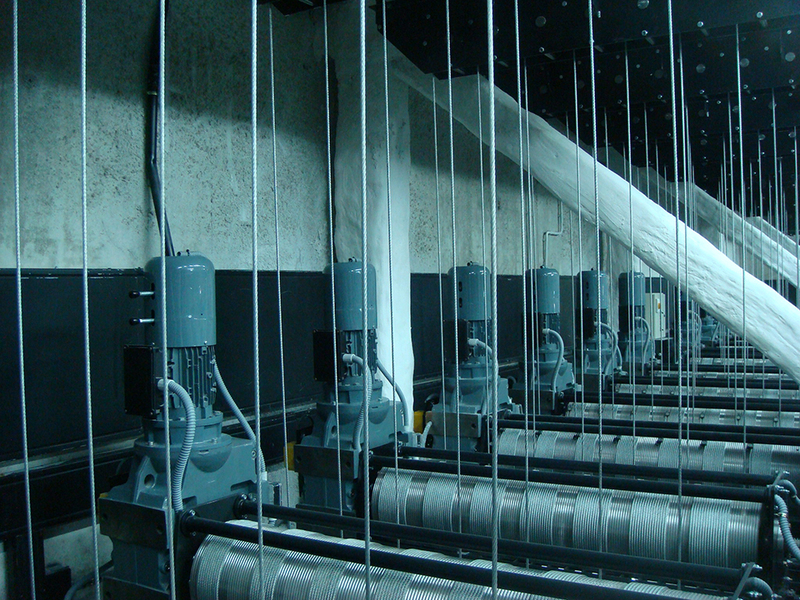 CHT-MAT allows for suspending loads over the stage such as scenery, lighting equipment, ceiling panels, draperies, etc. High-end portable, motorized equipment for moving point loads over the stage. CHT-PM is a compact, portable solution specially designed for stage applications in theatres, auditorium and multipurpose venues. Designed to allow horizontal or vertical mounting on grids. – Variable speed up to 1.2 m/s (it can be also manufactured in fixed speed under demand). – Load up to 5 kN. – Travel up to 35 m.
– 1 lift line, dimensioned according to the load.